Soldier Zane Lockhart rushes home to Texas to claim his son, then discovers Nora Caldwell’s adopted baby isn’t his. He still wants to make the army nurse and her boy family—in time for baby Liam’s first Christmas! When former navy SEAL Gideon Snow finds a baby and a woman with amnesia on a remote Arizona trail, he’s forced to take them home. Christmas at his ranch just got more interesting! Single mom-to-be Emma Sheridan has one job: convince Dylan Slade to sell his Montana guest ranch. 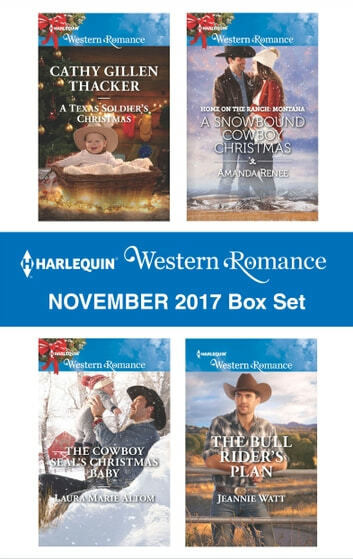 But when Emma is stuck in Saddle Ridge, she realizes she likes being snowbound with the handsome rancher. Jess Hayward is off on a rodeo road trip, where he plans to fulfill his bull-riding dream. But he doesn’t expect Emma Sullivan, his best friend’s sister, to tag along. She’s a distraction he doesn’t need!